During the measuring phase with the difference pressure method it can come in special cases with a test volume uncontrollably for small changes of the volume. Because at that time the test volume have no connection outwardly or to the comparative volume, such volume changes distinguish themselves by pressure jumps on the difference pressure signal (DP1). By means of the jump filter function such jumps from the measurement can be filtered. 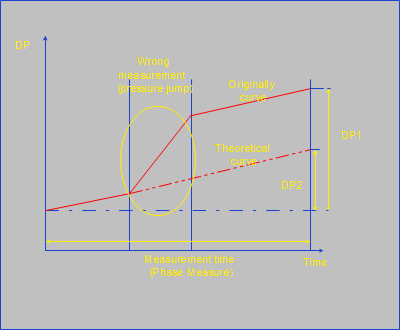 Then only the resultant difference pressure (DP2) is valued as a leakage.